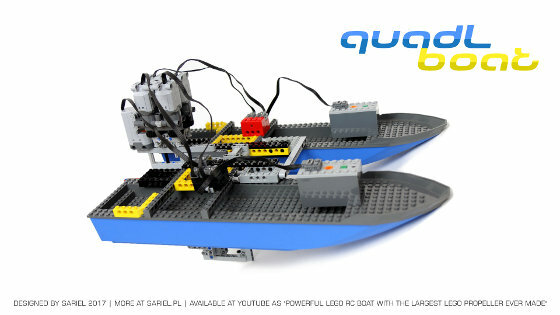 A boat built for speed tests with a large Lego propeller. Features drive, steering with a rudder and remote control with SBricks. Even though it’s been almost 2 years since I’ve built my last boat, I still have a soft spot for Lego watercraft. And having recently bought the GoPro 5 camera capable of measuring speed on the video, I felt a need to try – again – to build a fast boat. I’ve decided that my best shot is trying the big LEGO propeller I’ve used in my Catamaran boat – my only LEGO vessel to capsize so far – but this time with reduced weight and other improvements. The boat was built and rebuilt and tested with various propulsion motors and gear ratios over course of 3 days. 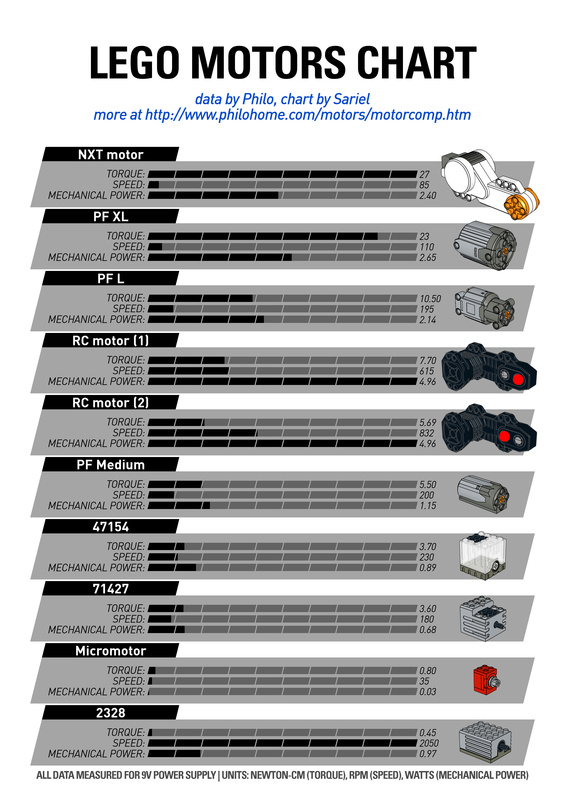 I’ve tried Lego RC buggy motors, Lego PF XL motors, and finally settled on four PF L motors geared up 1:2.5. The motors were controlled via 2 SBricks, each SBrick controlling 2 motors, with 2 Lego 8878 rechargeable batteries for power. Steering was done with a rudder, pretty much identical to that from my Catamaran, except this time it was controlled directly by a PF Servo motor for better accuracy and response time. Once again I have noticed that test in my bathtub and tests on a lake produce different results – it appears that clean water in the bathtub produces significantly smaller drag than lake water does. No matter what motors and gear ratio was used, swimming in a lake would always put more stress on the motors than swimming in a bathtub. The boat was barely able to reach speed of 2 KPH when tested on a lake, which wasn’t very impressive. It seemed to be one of my fastest boats, but without speed measurements of the older models I can’t be sure. If I had to guess, I’d say that my boat with 3D-printed propellers was faster. This suggests that perhaps the main factor limiting boat’s speed was the propeller I’ve used, which has been designed by LEGO for operating in air rather than in water. 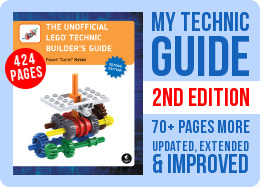 I suppose a LEGO propeller optimized for water could produce much better results.